Rita Costanzi devotes a portion of her life playing for the elderly and terminally ill in private homes, palliative wards and hospices. What began as a private offering assumed a more public profile in 1996 when CBC Radio broadcast a moving documentary on its program Tapestry. “The patients walked or were wheeled in, depending upon their various conditions. Several of them had almost no hair and their skin was yellow/grey. As I finished tuning the harp, I observed these faces – unknown to me – yet strangely connected by Destiny in this unique, poignant moment. “As I begin to play I carry the vision of these faces in my soul – the haunted look of the dying – a mixture of fear, uncertainty and resignation. It is so difficult at first, as the care givers continue their chatter and noise of the dishwashing in the background; a cell phone erupts, a door slams. As the music continues to weave its magic, slowly, imperceptibly a transformation begins to take place. Imprisoned as we are in this hardened world of matter – of technology, speed and noise – much effort and time are required to penetrate through and open the window, allowing the soul to escape. “My fingers move now – guided by unseen beings. About two thirds of the way through, I am aware that the room has become intensely quiet and filled with Presence. My hands hover between the tones and I experience timelessness in the interval. A feeling of blessedness fills my being, the hands, the harp, the tones, the patients, the caregivers and the room. Transported and transformed, this ending music is profoundly beautiful, nostalgic and exquisitely peaceful. "Rita's warmth and compassion for the terminally ill resonate right along side her masterful manoeuvrings of the harp strings. Her music speaks of life in all its passion, joy and pain while soothing at the same time--one can almost visibly see the tension leaving the bodies of the listeners as she envelops them in the beauty of her music." Proceeds from the sale of this CD will be donated to The Vancouver Waldorf School Hall Fund in support of children's arts education. Rita Costanzi is a professional concert harpist, who plays palliative music on the Celtic harp for the terminally ill and dying. The aesthetic quality of her playing, the spiritual nature of her music and the inner gesture of reverence toward those for whom she performs is completely unique and a source of sustenance. 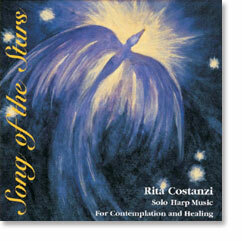 Rita Costanzi has been asked to perform her palliative harp music at the Annual Medical Section Meeting at the Goetheanum in September 2004. In August 2002 Cambridge Music Conference focused specifically on The Harp: Music and the Oral Tradition. The idea of the harp as an archetype of healing appears in the Old Testament. By laying his hand on the harp David spiritually heals Saul. Featured at Cambridge Music Conference in 2002 the Old Testament story appeared in the form of Canadian author Don Mowatt's 'The Collected Silences of David's Mother' (2000). The story is told from the point of view of David's mother, who, the author imagines taught her son to play the harp and influenced his poetic and spiritual development. The play is a series of stories and meditations on self-discovery, listening for the voice of God, accepting God's long silences and showing compassion for the troubles of others. It aims to be both art and meditation, reflecting on the words of Judaism, Islam and Christianity, combining images, sayings, metaphors and points of reference from all three religions. However, by placing the gift of inspired healing in the hands of David's Mother, the author is in fact not just rewriting history, but reclaiming the 'feminine principle' censored throughout the development of Western Christianity. Despite the centrality of the woman in Jewish family tradition, Jesse's wife – David's mother – remains unacknowledged in the original text. Historically insignificant, David's mother is thus eclipsed by the men in her life and reduced to oblivion. Nameless she remains invisible throughout history for all time. Although Don Mowatt's 'The Collected Silences of David's Mother' (2000) reclaims the 'feminine principle' as the unacknowledged source of healing within the Judaeo-Christian tradition, this particular piece was not only written for Rita Costanzi, but inspired by the healing quality of her music. Thus the transformed Old Testament story 'The Collected Silences of David's Mother' (2000) is more a living imagination and testimony of the healing capacity of Rita Costanzi. Although a highly esteemed harpist, Rita Costanzi plays the Celtic harp for the terminally ill and dying in hospitals, hospices and private homes. patients are regularly exposed to certain forms of live music. Over and above the profound effect of the music on the terminally ill, what might have gone unnoticed was how Rita Costanzi's playing was perceived and received by the medical staff and professional carers devoted to the well-being of the patients. 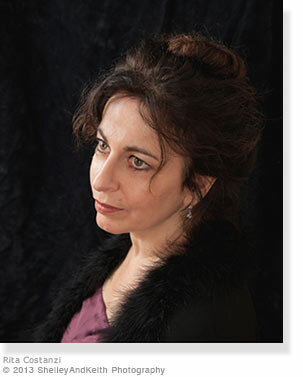 Rita Costanzi's music not only speaks to a depth of physical suffering many of us face with fear and impotence, but the sensitivity of her gesture clearly consoles many employed with the unbearable task of working with the terminally ill who are dying. Especially individuals devoted to looking after children facing death were deeply moved and profoundly grateful for the spiritual dimension and sensitivity in Rita Costanzi's work. With the healing power of her music, Rita Costanzi completely redefines life, death and human consciousness by waking an awareness absent in our daily lives through inspiring an experience of the spirit previously unknown.